I believe we have all heard the story and know how it ends. Unfortunately, the idiots running Ireland's government, especially Minister Brian Cowen, don't see it the way Iceland’s president does. However, Iceland's government did not see it that way either, but the citizens of Iceland took matters into their own hands and voted the bums out, rejecting "Icesave". Regardless of what deal Cowen signs, I see no reason it need be binding on the next Irish Parliament. Indeed, I recommend to to citizens of Ireland that they firmly tell their representatives that if they vote for Cowen's proposed budget, they will be voted out of office. That may be all it will take to stop this nonsense right here right now. Should I be wrong, the remedy is simple: Vote the bums out and vote in a Prime Minister and Parliament who will tell the IMF and EU to go to hell. Nigel Farage in a speech before European Parliament says “The Euro Game Is Up… Just Who The Hell Do You Think You Are?" Words alone cannot describe that video. Please play it. In case you missed it, please consider In Rare Agreement with Krugman; Onerous "Bailout" Rates of 6.7% Denied; Don't do Stupid Things; "Tell the EU and IMF to Shove It!" All these questions "Is the rate 4.7%, 5.2%, or 6.7% and if so for who long and on what portion?" are complete silliness. Except for those who participated in the property bubble (and they will be adequately punished), the people of Ireland are not at fault, at least in general. Should Irish Prime Minister Brian Cowen manage to hang on long enough to get the votes for an onerous bailout, I would encourage Irish voter to elect someone who campaigns on a promise to renege on the deal and default. Irish citizens cannot afford to rescue German, UK, and French banks stupid enough to bet on bubbles in Ireland. It should be the creditors' problem not the problem of Irish citizens. There is much more in the article so please give it a look if you haven't done so already. 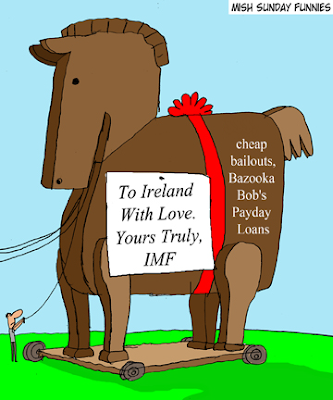 Bear in mind Ireland does need structural reforms. Those reforms must include some sacrifices such as lower minimum wages and reduced public sector employment. However, it would be foolish for Ireland to raise corporate income taxes or pay one penny to bail out UK, German, French, or US banks. Iceland told its creditors to go to hell and is better off for it. Ireland can do the same.